If the sweet scent of cherry blossoms and jasmine in the air isn’t exciting enough, Spring fashion – and all that it heralds – is sure to be bringing some serious joy to any fashion lover right now. From Spring racing frockery through to next level statement accessories and sensible, non-track-sinking shoes, it really is a fashion wonderland in stores right now. Just in case I haven’t made it clear, I reckon Spring is THE best time in Fashion Land, although it’s not hard to get bamboozled by all the colour, choice and options available right now. So in today’s post, I’ve drilled things down and picked up a few key Spring fashion trends and built outfits around them. 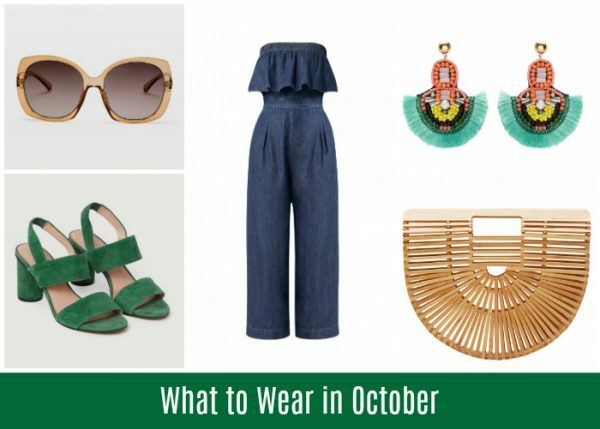 These outfits are just a starting point – inspiration if you like – that can be modified for every day situations like work/kid wrangling or for dressier occasions like parties, BBQs, weddings, engagements, the races and other fabulous Spring soirees. They all also include new season accessories that can instantly update some well loved – and worn – wardrobe faves. Now I’m just a little bit excited about this first outfit. I’ve dialled it up with some fab accessories, but at it’s heart, it’s a simple but fun denim jumpsuit, the perfect canvas to dress up or down. Jumpsuits are back this Spring and I for one, am very happy with that! Column Heels, $229 from Gorman. I’ve gone to town with texture – hello suede shoes, textured clutch and feathery earrings – and colour above, with pops of emerald green, one of my all time favourite colours to pair with denim. 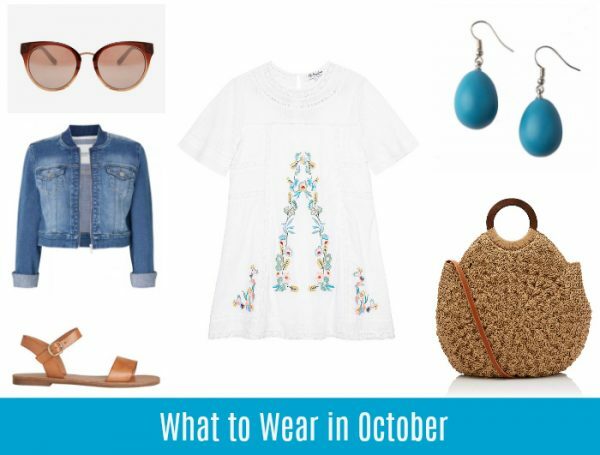 If you prefer a more low key approach, substitute the above with your favourite bangles or earrings and a comfortable espadrille wedge. Or, dress it down with a pair of sandals and a top knot for easy casual style. In terms of what to wear over it – if it’s cool – I’d opt for a cropped leather jacket or cape. Along with circular shapes, this fan shape clutch is one of Spring’s hottest styles. It’s a decent size too if a standard clutch doesn’t hold all your essentials and the neutral colouring makes it a versatile option. Now on to this next outfit which is a great smart casual option for weekend gatherings, lunch with the girls or when the sun’s out and you just want to ditch the jeans. Denim Jacket, $59.99 from Jeanswest. I bet some of you are thinking this dress looks more like a top than a dress, but I’ve done the reconnaissance. I’ve actually bought this dress already and I can assure you it definitely is a dress – I’ve got it in size L, and, at 175cm, it hits me a centimetre or two above the knee. I adore white in Summer and this pretty dress with it’s embroidery ticks the box for me, especially as I work from home and smart casual options are my priority when it comes to purchasing new pieces for the season. I’ve paired this dress with simple tan sandals (check out the fab range at Frankie4 Footwear sandals here if you need more arch support) and some fun but budget friendly accessories but it could be just easily dressed up with a tan wedge. Circular bags are one of this season’s biggest accessories trend too – this budget friendly option above is a good size and a bit different to the usual offerings and the shoulder strap is a handy inclusion if you prefer to go hands free. Most of us have a reliable LBD in our work to weekend wardrobe, and as I often say, it really is a great canvas on which to build an outfit for any occasion. 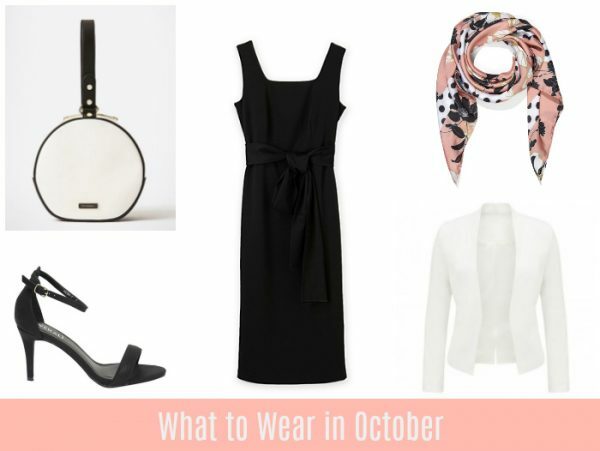 This time around, I’ve added a simple but chic white blazer to freshen things up; an on trend circular leather bag; and a new statement scarf which picks up on one of this season’s hottest colours – blush pink. All tie in – and update – a well loved LBD and a basic pair of black heels. Swap out the heels for a wedge and ditch the scarf for a fascinator, and you might also have a great outfit for Derby Day if you’re off to the races in Melbourne or a Spring racing themed event. If you are looking for a new LBD, you might also like to check out this budget friendly and sleeved option from Portmans or this sleeved wrap dress version from Birdsnest. So over to you, are you as excited about Spring fashion as I am? Which of the above outfits could you see yourself in?